I'm back home from attending fall market in Houston and had a great time. Since I didn't have a booth, it allowed me to mosey the aisles, talk with friends, investigate new stuff, and take pictures of lots of quilts. I wasn't feeling great when I went as that cold and sore throat I had just wants to hang on. It never got worse, but by the end of market, I no longer had a voice. Today, that's still the case....I sound gravely and awful. Perhaps it was from laughing so much! I'll gladly pay the price for the good time! I flew to Wichita, KS, and Lynne Hagmeier picked me up at the airport. We chatted our way to Dallas, and the next day, she took me to the Moda home offices and we shopped the Moda warehouse. 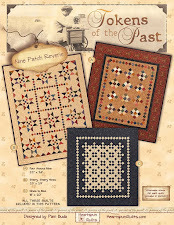 I've long been a fan of Moda, especially Lynne's Kansas Troubles fabrics, so this was a treat!! It was a real kick to see my patterns on the shelf. Oh, the dumb things that can make you smile. Let's start the market tour with Kansas Troubles booth. 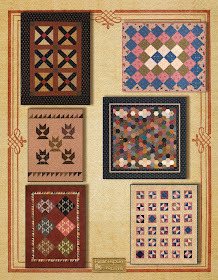 The quilts shown here are all from Lynne's new book, Loose Change, featuring her "layered patchwork" techniques. It was a big, big hit at market! 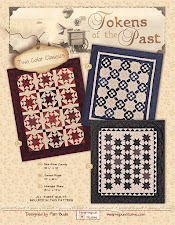 These projects aren't available quite yet as they are all made with Lynne's next fabric line, Pheasant Hill. Love the border stripe in this collection! One of the sweetest ladies you'll ever meet, Kathy Schmitz. 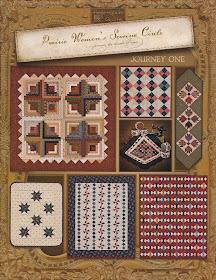 Kathy's book, Gather the Passing Seasons, was one of my most favorite finds at market. as a new designer. This is for MJ's Glamping (Glamour-Camping) collection. 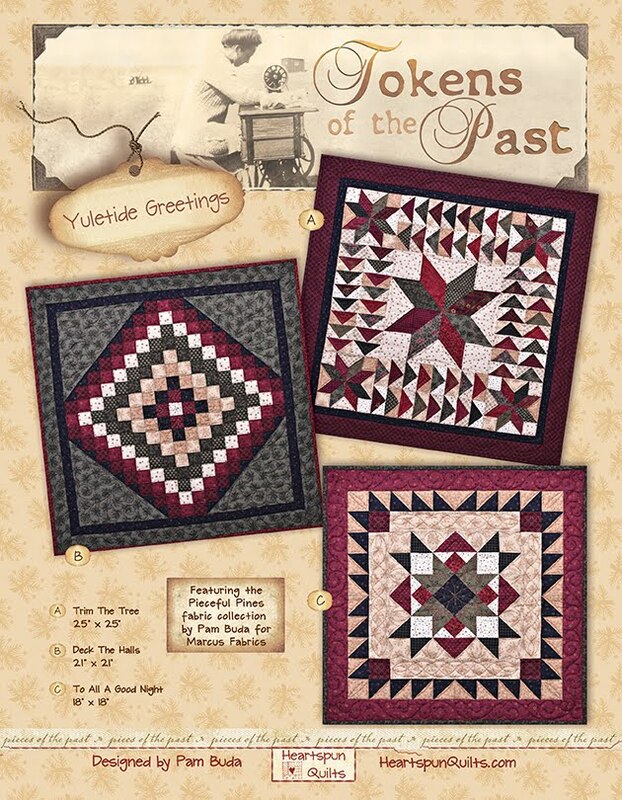 Lots of new stuff from friend Lisa Bongean and Primitive Gatherings. 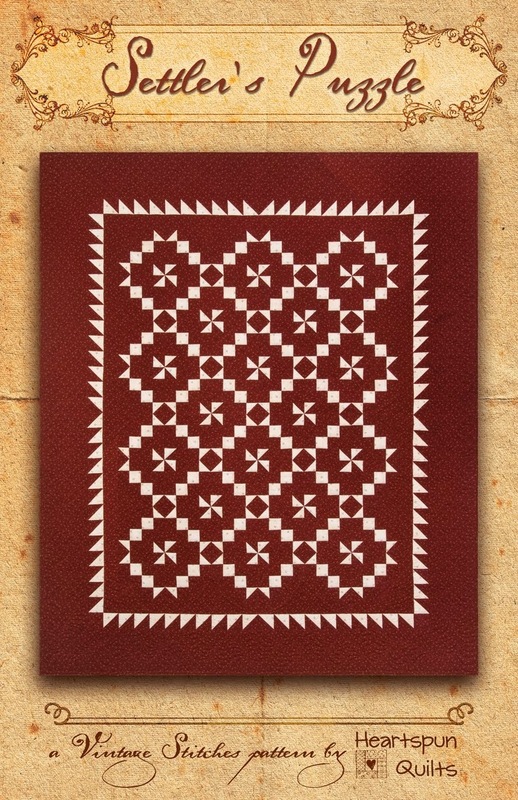 You can really enjoy the outstanding quilting talents of quilter Linda Hrcka on the green quilt! This snowman quilt is a new BOM coming soon! 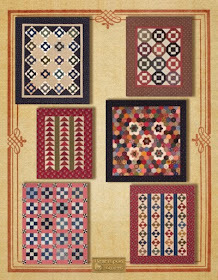 Lisa's Wool Alphabet Sampler was another market favorite for me! That's all for this post. More market photos coming shortly in the next post. P.S. I haven't forgotten about the next sew along. I just have to have time to organize it! It's been too long since we've had a chance to chat. Didn't I say in my last post that life was in a good place? Ah...how a few days can change all of that. A few deadlines I thought were many weeks away just became urgently needed now. I wasn't feeling all that great a few days last week...thankfully nothing serious, just really run down, arthritic, and crummy. In a word OLD! (Ugh...sigh) And....a dear friend passed away, so we were involved in that stuff for a few days. Before you know it, a week has gone by! I've been very busy in the sewing room (in between all of the above), and wish I had more to show you and talk about....but that's the problem when I'm working on things that aren't ready to share at the moment. I feel like I have nothing interesting to tell you about or at least you'd like to hear about. However...all that is about to change! 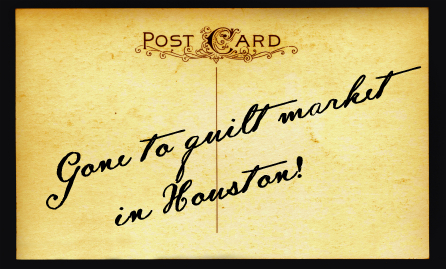 Tomorrow, I'm headed for Houston and Quilt Market!! 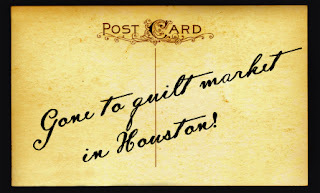 I'm not exhibiting in Houston....I'm going to help my BFF Lynne Hagmeier of Kansas Troubles, and to see what goodies I can find, look for vintage fabric, visit with friends and generally be submerged in Quilter's Disneyland! I'm starting my trip by flying to Wichita, KS, where Lynne will pick me up at the airport. That way we can ride to Houston together, chatting and shopping along the way. We're making a stop in Dallas, TX, and Lynne is taking me to see the Moda home offices, and shop in the Moda warehouse! I'm very excited about that!! I'll have my trusty camera and will report all the goodies I find when I return. In the meantime.... my friend, Becky, asked if I would query all of you with smart phones to share your favorite quilting apps. 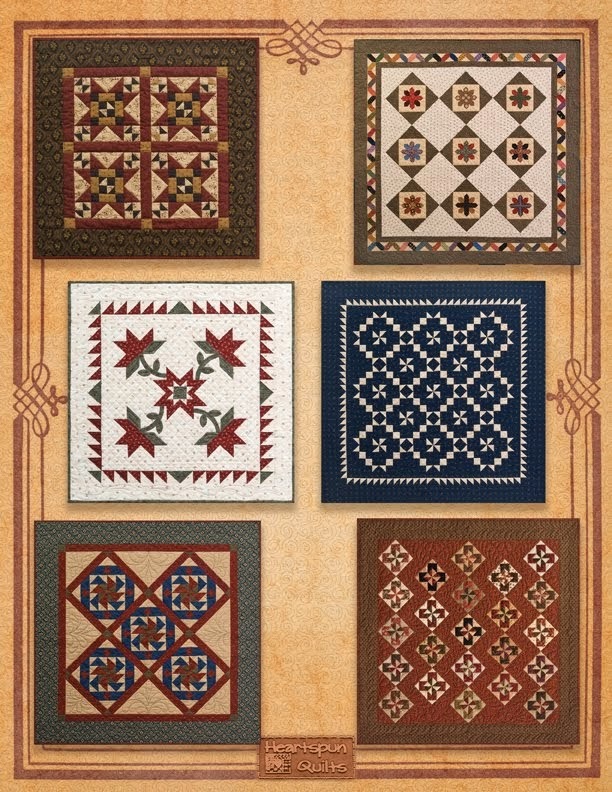 I don't have a lot of quilting apps, but would love to hear your favorites. When you comment, please tell us a little about what the app does and why you like it. Audible.com - which has an app for my phone, too. I download books to listen to....wonderful!! Pandora - listen to your favorite music over the internet. Dropbox - allows you to "drop" photos and documents in one device, where they are then accessible thru all devices, i.e., iPad, iPhone, and your computer. Fandango - access movie theaters for showtimes and movie info. SoundHound - listens and identifies songs on the radio, TV, and you can hum or sing the melody! Pinterest - You already know all about Pinterest, I'm sure. I don't know about you, but I think the best recipes are the ones I get from family and friends. And...aren't those "Family Favorites" cookbooks filled with the best recipes, too? Well....I didn't get this recipe from a friend or family member, but....I'd like (as your BFF, ya know!) to pass it along to you because it's a real winner!! I try to catch Ree Drummon's Pioneer Woman show on the Food Network, and saw her making this salad a week or so ago. I love to make any salad that isn't your usual garden salad, (however...any salad that I didn't have to make always tastes better!) especially when it comes with an original salad dressing. So...last night I made 2 new recipes. First up was Ree's salad, aptly named Apple, Cherry, Pecan & Blue Cheese Salad. It was fresh, quick and easy....and WOW yummy! The dressing has only four ingredients and was delish. It calls for Dijon mustard but didn't taste mustard-y (?) at all. The other absolutely delicious item I fixed for dinner was Lisa Bongean's Pasta Parma. OMG! My family and I love, love, love it! Our daughter, Nicki, is very sensative to anything too spicy or hot, so I omitted the red pepper flakes. Super delish! Click here to go to Lisa's recipe. I am enjoying a wonderful spell of "normalcy". Aahhh....it feels great. No cramming for quilt market, no overdue projects, just going along at a nice pace. It won't last forever, I know, so I'm trying to soak it up while I can. The holidays are drawing nearer by the day, and that always adds much to our "to-do" lists, doesn't it?? Sigh. Don't get the idea that I haven't been ﻿keeping myself busy! On the contrary....I'm in the process of designing two new fabric lines, creating three new workshop offerings, and have designed six new quilts, and two hopefuls for magazine submissions. Not to mention collecting ideas and doing historic research for Journey Five. 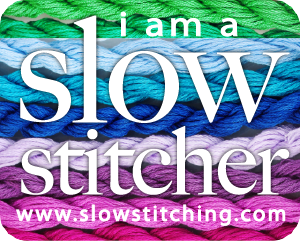 Oh....and a new sew-along. From the poll I posted last week, I am amazed that the great majority of you want another one as soon as possible! I am quite surprised by that! Sewing production will begin shortly, and as I dig thru my stash, pulling, auditioning and selecting the fabrics for all of these new projects, I will also hit my scrapbag and start making the sew-along blocks. I'll let you know ahead of time when it will be. 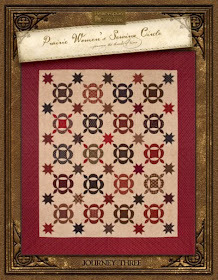 Also, I have restocked my Heart of the Prairie Fat Quarters and Fat Eighths on my website. This is your last chance to get them. When they're gone....they're gone! Click here to order. The photos of my Forget Me Not sew-along are coming in, and they are just great!! 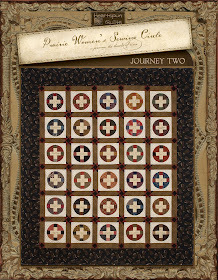 Allow me to remind you to email me a photo of your quilt, along with the state or country where you live. Please send your photo by Friday, November 30th, and remember....your quilt does not have to be quilted or bound!! I was finally able to access all my photos from our trip to Niagara Falls. Computer issues are resolved as well, thanks in large part to the Geek Squad who worked with me over 6 hours to fix and tune-up the 'ol computer! So...after much frustration and delay......here's my photo journal of our trip...highlights only, of course. The first stop on our road trip was to Cleveland, OH, and the Rock & Roll Hall of Fame. If you love R&R, this is a must on your Bucket List. So great to see so much R&R history, and rest assured they play great music while you're there! Loved it! They don't allow any photography inside, so I wasn't able to show you more, but trust me....it's worth the trip. Niagara Falls was another Bucket List item for DH and me. It surely is a sight to behold. We stayed on the Canadian side, and the view from our hotel was spectacular. We strolled the parks on both the Canadian and American sides of the falls, each with its own perspectives and attributes. The weather was lovely, the leaves were changing, and we had great food when dining. What more could you ask for? Well......how about some shopping! 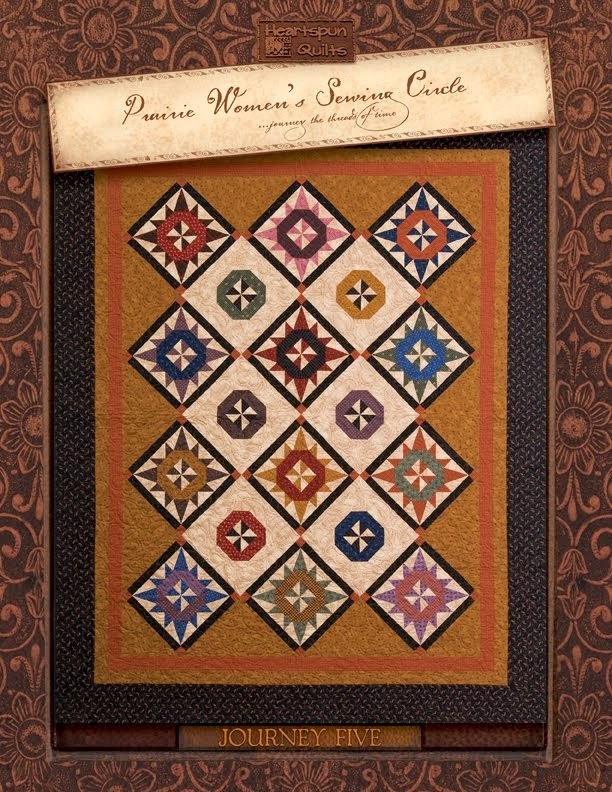 A short 30 minute drive from the Falls is a wonderful quilt shop called Patchwork Garden. ...including this luscious wool. I had to buy some...quite irresistable!! Hhmmmm....that fabric looks very familiar! They just started The Prairie Women's Sewing Circle club at the shop!! Guess what other favorite designer's fabric they have loads of!!! 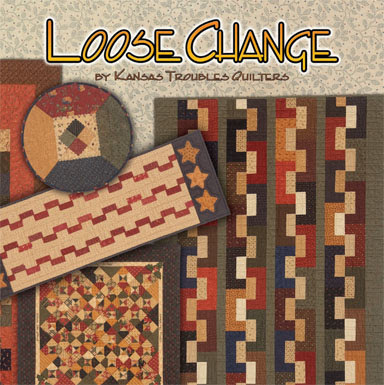 They had oodles of Lynne's Kansas Troubles fabrics. I took my opportunity to stock up on some of my favorite prints. You know...the ones you buy 1/2 yard of, and then think...."why didn't I buy a couple of yards of that one? It's soooo good!" Yup...that's me. Patchwork Garden's owners, Bev & Joan, gave me permission to tell you that, in June of 2014, both Lynne and I will be going back to the shop for a series of workshops and a combined lecture & trunk show! We're so jazzed about this!! I know it seems like a long time away, but it will be here before you know it. Technology ~ Love It, Hate It!!! When last I left you, I was headed out of town to Niagara Falls for a short little getaway with DH. On the trip, I took my iPad, intending to blog along the way. I wasn't sure about the availability of Wi-Fi connections, so I wasn't sure I could blog. I had plenty of Wi-Fi connections, and took some great photos, but when I tried blogging, nothing happened. The blogger app said I was successful, but the post never made it. So...I waited until I got home, and tried again today to blog using my iPad....same exact thing. Frustrated, I tried putting the photos from the blog onto my computer, and for some reason, my computer isn't downloading anything today. Ggrrr. I wanted to give you an update so you wouldn't think I fell into the falls and was on my way to Lake Ontario! I'm here...home....saying pretty words in my head to my computer....frustrated. So...while I get the kinks worked out....I have a question to ask of you. 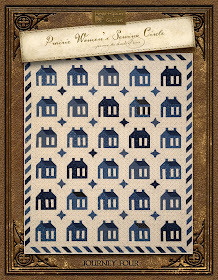 I've designed the next Pocket Patchwork Sewalong project. It will be a little quilt using up loads of scraps. No kit this time as it is intended to use up small leftover scraps. It will post once a week over 5 weeks. 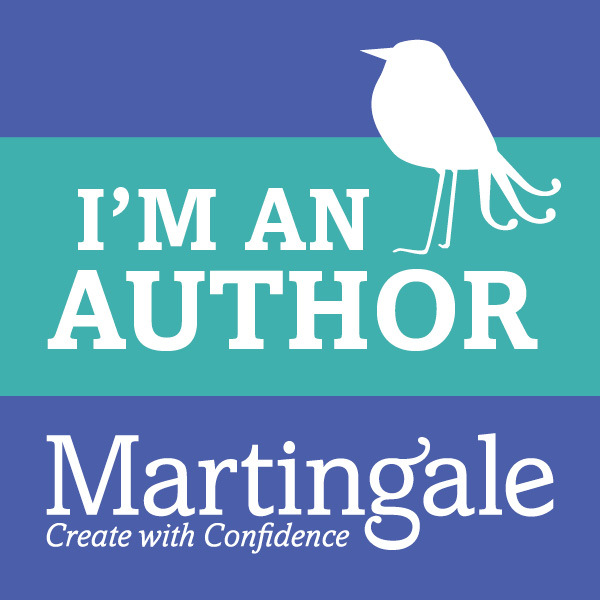 I get lots of emails asking when the next sewalong will be, and I'm not sure what you'd like to do....so....I've posted a poll on the blog. Look for it at the top of the right column. Please vote as I'd sure like to know what you'd like to do! On another note....exciting news....Lynne Hagmeier's new book, Loose Change is hot off the press and available right now!! 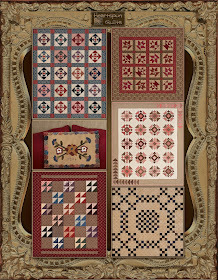 It is full of new designs using her easy piecing Layered Patchwork technique. Lynne's Layered Patchwork technique takes full advantage of all of the different Moda Pre-cuts for very clever and inventive quilts you can make in no time. The book fully describes the technique, and is loaded with great instructions and lots of pictures. 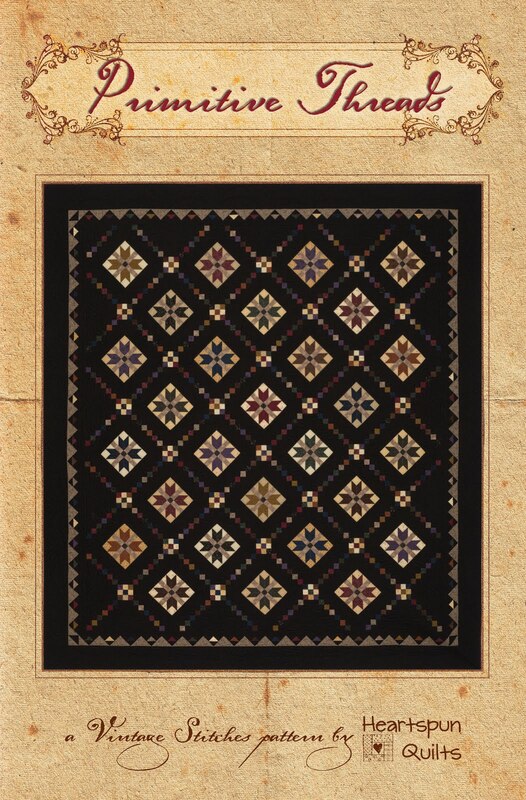 Click here to read more about Lynne's book and see several Loose Change quilts . 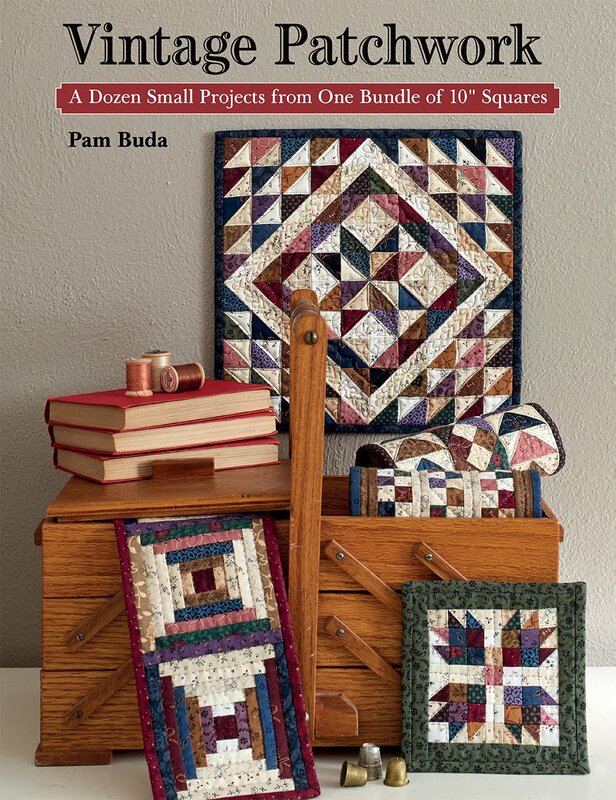 Click here to order a copy for yourself, and while you're at it.....how about one for a quilt loving friend! Christmas is right around the corner, and this would be a terrific gift!